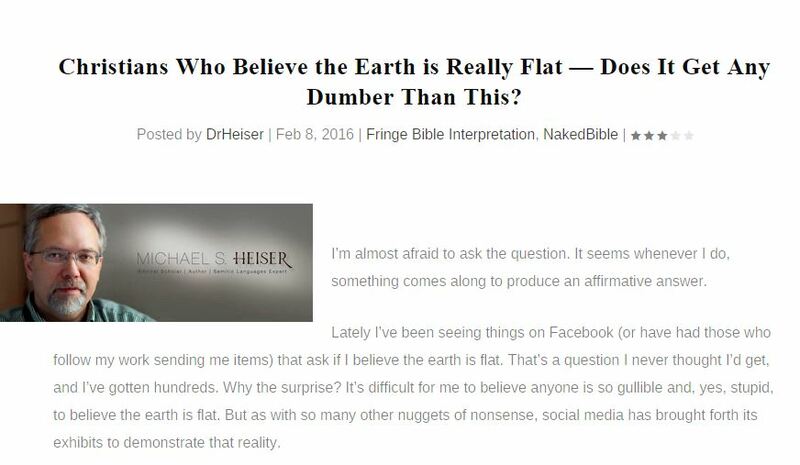 Dr. Michael Heiser does NOT believe the Earth is flat! No kidding. Never said he did. Around this time last year (2015), while searching to confirm that the above graphic was indeed from Logos, I stumbled upon some writings and a video by Dr. Michael Heiser. This was at a time when I was receiving a ton of flack for even suggesting that the Bible was a “Flat Earth book.” Much to my surprise, I saw that someone of Heiser’s academic stature fully agreed with everything I had been saying. So, I included some clips of a lecture he gave on the subject in one of my presentations to prove the point. Shortly after that, I was publicly threatened by the good doctor. He accused me of being unprincipled, dishonest and worse. Funny, how academics can cite the work of other academics all day long, but when a so-called “village idiot” does the same, they blow a fuse. If you’ve actually seen my video, you will immediately recognize that he obviously did not, because it really does appear like he was giving a knee-jerk response – likely based on gossip and half-truths sent to him by others. Perhaps for good reason. For instance, a YouTube user named TigerDan925 posted a video totally taking my video out of context and absolutely misrepresenting both myself as well as my use of Dr. Heiser’s work in that video. Dr Michael Heiser has never said the earth is flat. See for yourself. The flat earth community will cease on anything to give credence to the flat earth theory. 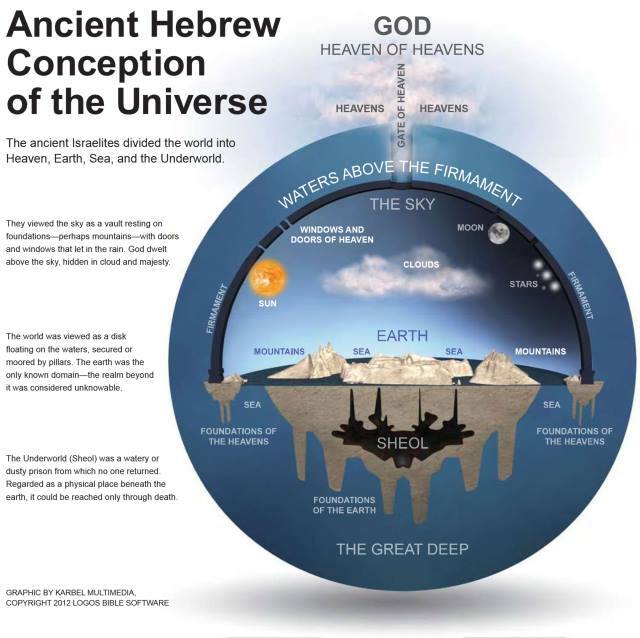 There’s a big difference between showing what ancient hebrews believed and flat earth. 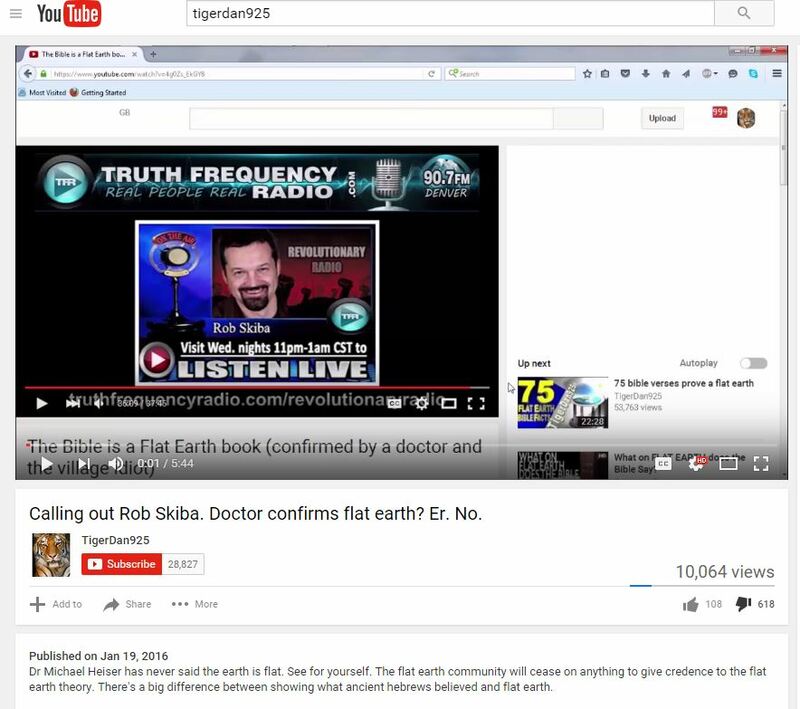 I just watched all 37 minutes and 45 seconds of Rob Skiba’s video. It seems to me TigerDan… that you are “misunderstanding all you see”. Rob Skiba’s video containing an excerpt of a lecture by Michael Heiser is about posing the challenge of… IF YOU TAKE THE BIBLE LITERALLY… YOU HAVE TO COME TO THE CONCLUSION, THAT THE EARTH IS ON PILLARS, IT’S DOMED, GOD IS ABOVE THE DOME, THE SUN AND MOON ARE INSIDE THE DOME AND THE STARS CLOSE (not sure if they’re inside or not, but I think they are). That’s what Rob’s video is about. Why are you going on about this??? You are misunderstanding what was presented in that video. Come on man!…. No one was being “unprincipled and deliberately dishonest.” His whole view (including his personal denial of the cosmology put forth by the Biblical writers – which he so eloquently demonstrated in his presentation) was totally, completely, fairly and accurately included in the clips of his speech that I used. My only point was to show that the authors of Scripture believed the world was flat – not that Heiser, myself or anyone else living today does. In each case where his work was cited, it was in the context of proving that the Biblical authors did believe it was. Toward the end of his rant, Heiser then posts a link to the exact source video I showed. SMH. Uh gee, I wish Ida thunka dat. Of course, even highly credentialed academics apparently fall prey to “condemnation before investigation is the height of ignorance” every now and then too (perhaps more often than any of them would be willing to admit). But if he had actually taken the time to see how he was accurately represented in my work, he never would have lashed out as he did. By the way… you don’t need to include a disclaimer, when the source used states all that needed to be said in the first place. Indeed. If we go the route Dr. Heiser takes, we effectively nullify Divine inspiration and might as well toss out any notion of Biblical inerrancy too. What we end up with is a hodge-podge of writings left to us (apparently) by ignorant sheep herders and fishermen, that we can pick and choose passages from as we wish, forcing whatever beliefs we want onto or out of them. As the Francis Schaeffer quote states, the Bible becomes totally useless as a valid source of revelation. If it’s all just metaphor, symbolism and poetry as many a ball Earth advocate would have us believe, then why even read the thing? What possible value is there in a document that is so obviously prone to error and “idioms” that could lead to any number of outlandish theories concerning our existence in time and space and our purpose here now and in the future? If our origins are incorrect, how can we trust anything concerning our final destination? If the Beginning is all jacked up, how can we trust any prophecy concerning the End – especially since Isaiah said the End was declared from the Beginning (Isaiah 46:10)? When Isaiah, Yeshua, Peter and John told us that all of the stars are going to fall to the Earth in the Last Days, were they full of it? Were they speaking in cryptic language, spewing idioms and “poetry” we have no frame of reference to understand? Who determines what is literal and what is poetic? Science? Dr. Heiser and others would seem to indicate that to be the case. I think Sylvain Durand leaves a very valid set of observations concerning this issue in the above comment (which, at least as of this date, was never answered by Heiser). In conclusion, it should be painfully obvious to anyone who actually saw my video(s) that I never even so much as insinuated that Dr. Michael Heiser believes the Earth is flat. Rather, only that he confirms the fact that the Holy Spirit inspired authors of Scripture clearly did. But thanks to gossip, slander and busy-bodies who love to bear false witness, misunderstandings abound on social media. This does not help anyone in their quest to understand what it is that the Bible is trying to tell us, and how we are to believe it, and such activity only serves to cause more division and strife among the brethren. I had the pleasure of running sound for you at the “Exposising Darkness In Prophesy” conference in Evansville, IN. The conference was an awsome experience! I think I had tennis neck by the time I we left Denny’s that evening! Just wanted to ask when you might be able to compile all of your Flat Earth stuff onto DVD(s)? I think it would be awsome to be able to watch and share such an important topic via DVD. Hey Dusty. Nice to hear from you. I hear ya on the tennis neck, LOL! Funny you should ask. I was actually considering making data DVDs (instead of standard DVDs) because I could fit more on a disc. People could then copy or play them off the disc on their computers if they want to. I may do this in the near future. Currently working on two 3 hour synopsis videos giving and overview of the hundreds of hours that are on the nearly 70 videos I’ve made so far. I like to think of myself as a ‘biblical literalist’ but like pretty much everyone who hears about the flat earth thing, I said thats just too ridiculous to believe… until I realized that believing in the ancient cosmology of the writers of the Bible is a minimum requirement for actually believing (or understanding) the more difficult parts of the bible that they wrote. It’s tempting to try to make the Bible fit what everyone knows to be so (the NASA narrative) because it’s embarrassing that the book we claim to believe in doesn’t line up with Google Earth, or Star Trek, or Universal Studios, or whatever. We want to believe in both our pop culture Sci-fi and our Bible. It’s not easy to give up the pop culture, since that is what keeps us ‘normal’. But normal is not a fair exchange for the truth. Rather than assuming the Bible is a globe earth book, we should allow it to be a flat earth book just as it was written. Jesus is a flat earther. Nuff said. i will admit that i am having a hard time wrapping my head around a flat earth cosmology and where i am at right now and have been for some time is more along those lines except on a much larger scale exactly how you and others pictured it according to the Bible only Gods terarium(hope that is how you spell it) as you name it contains the universe itself, having its own limits and boundries. i guess you could say i am dealing with more of a scaling issue than anything! Thanks Gail. Well, I can’t say for certain, but it did strike me the same way – that perhaps it was hitting a little too close to truth. But of course, that is pure speculation. Amen brother…right there with ya. I’ve got no use for folk like Dr. Michael Heiser, who present proof one thing yet deny it under “peer-pressure”. I no longer stand as a sphere-earther. Either scripture is true or we’re all in huge trouble. Time to get over ourselves. Time to stand. Leaning more and more in that direction myself. My only issue with the FE model right now, that I cannot reconcile is the 24 hour sun in Antarctica. If someone could just solve that one, I’d be a lot more fully in the FE camp than I am now. That said, the more I look into the testable, repeatable evidence that WE can do ourselves (without relying on NASA, the military or government), the more intrigued I’ve become. I thought the 24 hour sun in Antarctica was debunked as a doctored video? No. Whatever the deal may be with that particular video, the phenomena has been documented as far back as the late 1700s. Rob did you ever figure out the 24 hour sun in Antarctica? Since its been over a year (June 10, 2016) since you commented that If someone could just solve that one, you’d be a lot more fully in the FE camp than you are now. Hi Rod, I would be interested in a body of work with actual proofable recreatable studies/Tests/Experiments. Have you any idea where I could find such a body of work? I have a few ideas on such experiments if anyone might be interested. Yes, Steff, I’d be delighted. The separation has begun. Keep fighting the good fight Rob. hey rob, here is a good video on thr 24 hr antarctica theory. it is short and suports our FE model. Unfortunately, this video doesn’t answer or solve anything. While I can agree with that person’s frustration about not being able to test or verify anything for ourselves, it doesn’t answer the question. It wasn’t just NASA sources that gave us the information concerning the 24 hour sun. That deal has been reported since the late 1700s by people who’ve gone down there and logged their journey. So, we’re still left with the problem of verification, but if we disagree with the eye-witness accounts, then it is up to us to PROVE why what they said is wrong. So far, the FE community has failed to do so. I think a 24hr sun isn’t enough to prove a globe. It’s just a strange occurrence on a fe. I mean lifting the veil on the grand deception isn’t going to be easy. I think you are experiencing severe cognitive dissonance. You claim that the Bible is Flat Earth. You claim you believe the Bible. You claim you believe the extra-biblical texts that have points of disagreement with the Bible. You claim you are a flat earth agnostic and do not totally believe it. You can’t hold positions that are in conflict with each other. Ironically, I have noticed in several of your youtube comment exchanges that when a commenter has gotten the better of you, you are the first to claim the opponent is experiencing Cognitive Dissonance. Perhaps you are projecting? Something you may want to consider and “iron out”. Just my honest observations. I’ve already seen that, and it does not answer the issues I brought up. It only confirms the first issue in my original post is indeed *one* of your position(s). So all you said there is there is truth, but do not say precisely what it is, and of course, you don’t believe NASA, which is not the same as saying you believe FET. Saw your video of Chicago Skyline being seen from boat 40 miles out – the other day. Many of your videos make some interesting points (that does make one wonder). Anyway, hoping you would make a comment or two about the $1.1 billion mission Juno spacecraft which NASA is currently releasing pictures. Also, all the vehicles sent to Mars and have pictures transmitted back. NASA has spent much money producing these adventures (and have pictures supporting them); is it your contention these are all being “faked” ? Hi Rob and All – For me, it comes down to this basic tenet: If Genesis Chapter 1 and all the supporting Scriptures pertaining to the Creation and formation of the Earth and skies is not 100% true, then I am done with the Word of God because it has little or no use. After that, it’s “eat, drink, and be merry, for tomorrow we die.” Having said, after having studied the Koran, the Bhagavad Vita,numerous ancient religions, mythology, humanism, politics, economics, and social arts for 35 years, I can say that I have found only one source of completely logical Truth, and that source is the Scriptures of Hebraic origin. Without that, no faith, no hope, and no selfless (agape) love. Continue the fight, Rob. More than we know relies on the outcome. Rob, like you, I have studied Dr. Baugh’s work closely, from many years back. I was recently considering pulling out the model I have on VHS to see if he was on point with a couple of areas (outside of FE). Your comment as to his firmament position was insightful, as I am new to Flat Earth. I would appreciate any other distinguishing points, if possible. The other areas of which I mentioned: 1. To determine if his model is consistent with an Electric (Plasma) Universe and 2. Climate warming considerations. More specifically, obviously the many models used are riddled with issues. However, it would be interesting to reconcile the antediluvian (barometric, etc…) considerations. No doubt, we have major geoengineering issues that need to be considered (decades of solar radiation management, etc…). All that said, it would be a great exercise to compare / contrast these three areas with Dr. Baugh’s research models. Thank you. Bill. Thanks Bill. Yes, I think the pressure issue still works well in the enclosed model. Think bathysphere or submarine. There is increased pressure under depth. Before the Flood, the enclosed model was under more water than it is now.